planetf1.com • View topic - Force India VJM10 Unveiled! 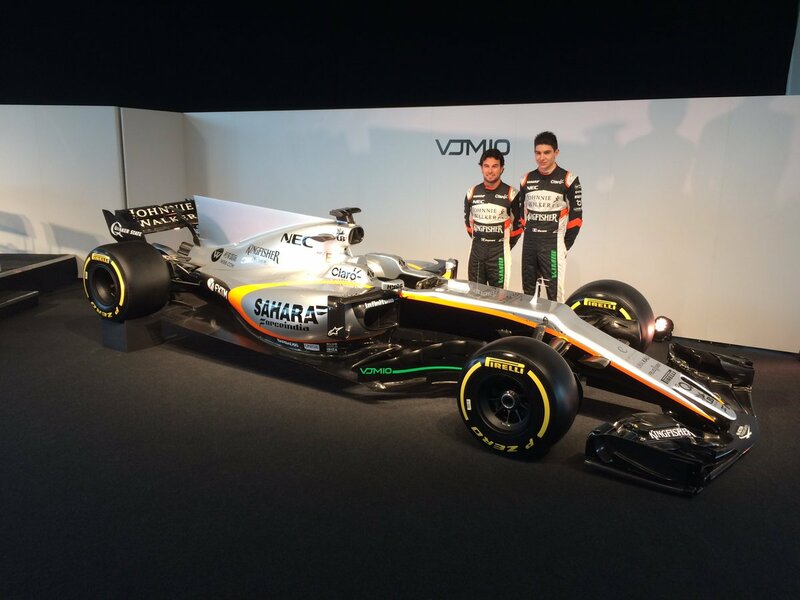 Post subject: Force India VJM10 Unveiled! Last edited by UnlikeUday on Wed Feb 22, 2017 4:49 pm, edited 8 times in total. 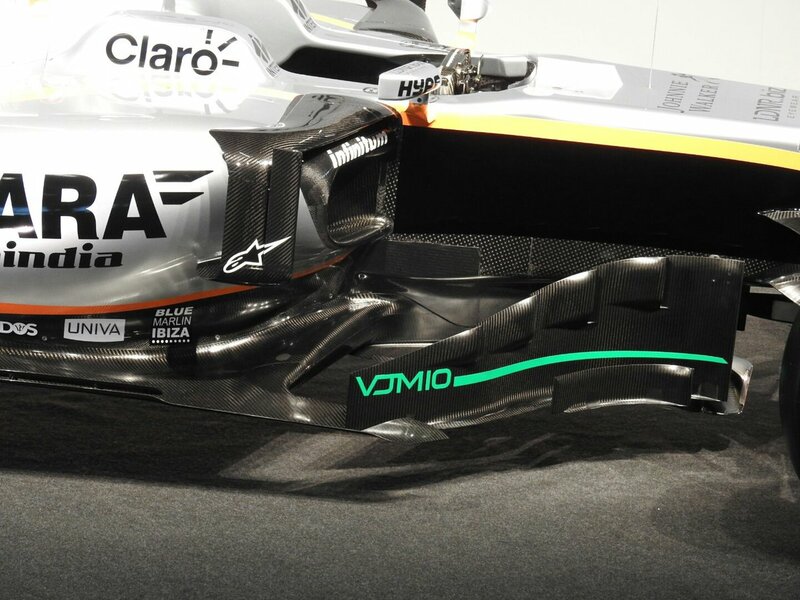 Post subject: Re: Force India VJM10 Unveiled! Bit underwhelmed with the livery! Amazingly dull. I wish they'd go back to the white, green and orange. EDIT: I do like the race suits though. Last edited by BeOnEdge on Wed Feb 22, 2017 2:18 pm, edited 1 time in total. Ugly everything. This "thing" will surely not be popular among model collectors. And I'd just stuck Perez in my WDC top 10 in the games thread. I'll be removing him sharpish. Looks terrible, worst by a long way. That shark fin, did they just stick that on today after seeing the other cars? And we were saying the Sauber had drag! True. The Sauber even looks much more prettier than the VJM10. I was hoping for more Orange. Keep him for the time being. 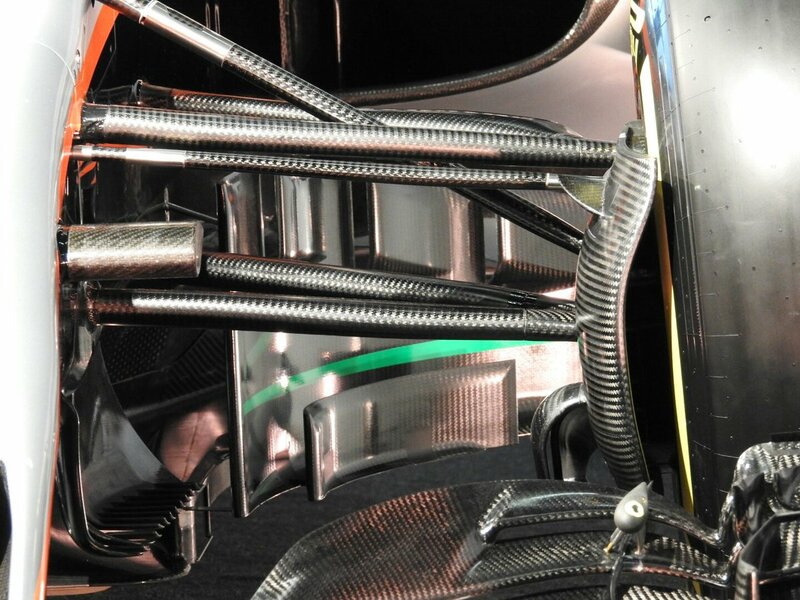 That step in the nose up at the bulkhead is to house the third element in the HPC suspension Mercedes have. Might not be pretty but outside Mercedes and Red Bull, FI were the only team to run it apparently so it should be more developed than the ones Ferrari,STR,Williams and McLaren bring(Assuming they all do). Might not be pretty but it might be quick. That nose is just a more developed version of their nostril solution too. I think I just saw hairs in those nostrils. I just don't get it. I'd rather see a grid full of Scuderia Italia Lolas than these things. 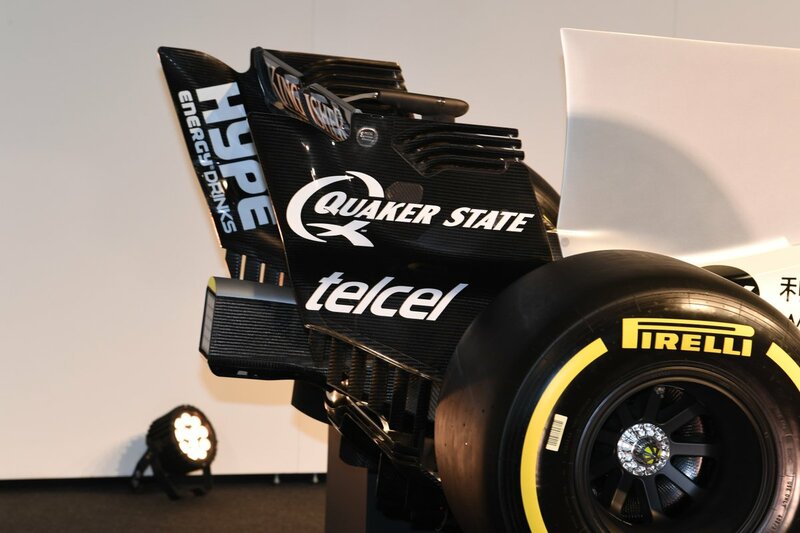 I can picture airflow struggling to reach the back of this "beauty" (same as the Sauber car). Very industrial look - like the McLaren of the last few years - with too many straight lines and sharp edges. That nose is so ugly it should be illegal. It seems like only Mercedes, RedBull and ToroRosso use "curves" to design their cars and guess what? they usually have efficient aerodynamics. Well that's not a looker, is it? The shark fin seems a very rushed job. Why weren't one of the sponsorship logos moved onto it? It' looks as though the graphics department designed the livery and logo locations didn't know it was going to be there. Also, why the 90 degree angle and vertical rear? None of the previous generation of shark fins were so basically shaped, were they? And I admire their chutzpah in combining the two most hated nose features into a single car. I believe the shark fin will get more refined by Melbourne. I'm really not convinced the shark fins we'll see in launch spec will be the same as in testing. Same with the barge boards. That shark fin looks like it would flip it!. Overall a miss and the Step on the nose is horrendous and I thought they made rules that specifically required a vanity pane so we could be spared the pain of spraining our retinas! The Silver is way too much and kills it but their launch livery either last year or the year before was bleh and they tweaked it before Melbourne and it was spectacular. Hope this is the case here too. Some Black will do wonders to hide ugly and make it look much better. The front and rear wings look incredibly superb and I notice a huge Johnny Walker on the rear wing which is good to see for this team. You never know WHEN VJ will be tackled in a paddock and thrown in the back of a police vehicle. I also hope they add some colour to their livery. I was fooled in thinking there will be good amount of Orange as their posts had VJM10 written in Orange. Funniest thing I will read or hear all week!!! Esteban Ocon: Roscoe was here. Force India are targeting 3rd in the constructors championship this year that means they got to get top four results from the get go, it will be interesting to see how Esteban Ocon does this in the F.I but the car has to be quick from day one. Looking forward to winter testing next week but I know the lap times dont mean much until qualifying for Australia, hoping Force India have a good season but so could McLaren and that could upset the apple cart. Hmmm, not great. That nose is just clumsy. After the Sauber and Renault, extremely disappointing. Yeah I thought they were going for a good amount of orange too. Does the silver come with one of Sergio's sponsors or something because I've been waiting on them going back to green,white and orange but they seem quite determined to keep with the silver and black theme. Oh god, burn it with fire!! I dont think they could possibly have found a worse backgrounbd wall/floor to display it against or lit it any less impressive if the tried. Where is the downright ugly option? I would like to vote that. Ouch, that is one ugly car! What happend to the ''aggresive'' look? Are they going to scare their opponents (and fans) with uglyness?! And that's where we store the sick bags. Lower wishbone is nothing special really. Not the best looking design, but not the worst either. The Barge boards… Now THERE the car is quite interesting. Most cars have elements coming up from the floor and/or the top, but FI's approach seems to be to channel as much air as is needed to specific areas around the sidepods without obstructing flow on the lower half of the sidepods. They are noticeably quite clean and clear so as to allow as much air as possible to sweep around towards the rear of the car. I'd guesstimate their looking for large volumes of air to make it towards the rear elements and if they've managed to maximize the coanda effect in just the first third of the sidepods, tons and tons of air will make it's way to the rear for serious performance gains. If they should find some of the air becomes too turbulent, they can always add bits of bodywork here and there to calm it down and reroute it more efficiently. And re-evaluating the overall appearance of the car, it feels as though perhaps a great deal more of this car came directly from CFD computations. It's that much of a mish mosh of concepts all thrown together to create a singular package. It may very well be a great performing car, however, as with every season… I shall wait and see what it can really do come Q1 at Albert Park. I think we will see some more finishing on the one that actually runs. Maybe short of time, maybe leaving it as long as possible to show something.